Create a mission and vision for your practice along with your list of practice values. Craft detailed job descriptions for each position. Focus on personality and fit. Let's dig in a little deeper to each of these steps and give you some more tips for making sure your staff is doing their best to build your practice. Before hiring your very first employee, you must craft the mission and vision of your practice. Like any business, if you don't take these critical first steps, you'll be flying blind. With no overarching guiding principles, it's all too easy to get lost in the weeds. And if you don't know what your practice values, how can you find the right people to work with you? by defining your mission, vision, and values, you now have a measuring stick for each candidate you bring in to interview. Additionally, before you even post jobs, you need to create job descriptions. This will help you write the job posts and ensure you get the right applicants. Without a thorough job description, you can't be sure your hiring qualified applicants. This will help you weed out those who shouldn't even be applying! Be sure to include the personality traits and values you wish to see in your staff. Those who apply are the ones who will end up with the positions! Remember as you interview that it's much more important to hire for personality, values, and fit (barring the person isn't certified for the position for which they are applying). You'll get much more value out of a staff member who has the right attitude than someone with more experience. Focus on finding those applicants who you can see making a real effort to build your practice and grow with you. See how those values help guide every part of your business? With your staff, there's a lot of HR, benefits, and other details that need to be addressed. But for today, we're just going to talk about ensuring your staff does everything they can to grow your practice, treat patients well, and carry out your vision. That means a few things while they're employed. One is documenting processes and providing scripts (when necessary). This can be tedious and time-consuming—but only at first. Once it's done, you have a way to keep your staff accountable and can save time and energy in the long run. Documentation of processes help with training as you onboard new staff, making sure current employees are on track, and can even be handy in case you need a temp or other employees to pitch in due to illness or vacation. Scripts give you the opportunity to provide phone and interpersonal training on how you want your staff talking to prospective and current patients. These documents can be as detailed as you want them! Maybe they're flowcharts or diagrams, or maybe they're just checklists. It's up to you, but you need to have them. Along with documentation comes the need for providing regular training opportunities. This means both in your office, and sending staff to outside training. Be sure to include this in your practice's schedule and budget. Training allows you the opportunity to address issues before they become problems. It gives your staff a chance to ask questions, clarify procedures, and realign what they're doing in the office with your overall practice goals. Give staff an even more personalized opportunity for feedback, questions, and training with regular performance reviews. These don't have to be stiff or formal. But they need to be informative, helpful, and inspire action. You want to hear them, and for them to know they're being heard. Likewise, you can take the opportunity to fine-tune their position in your office, groom them for bigger roles in the practice, and take corrective action (if necessary). Inevitably, you'll have staff turnover. Whether they're moving on voluntarily or you need to let them go, staff will come and go. Many business owners are missing a huge opportunity when their staff moves on: the exit interview. Barring extreme circumstances, a staff member should be interviewed prior to leaving. This gives you yet another chance to learn about your practice from a different point of view, get feedback, and make changes in your office. You always have the option to take or leave their opinions, but getting a new viewpoint never hurts. Treating your staff well, educating them, and making sure they understand the mission and vision of your practice will help you practice succeed. You literally can't do it without them! Give them the tools they need to feel empowered as they represent the practice to current and prospective patients. 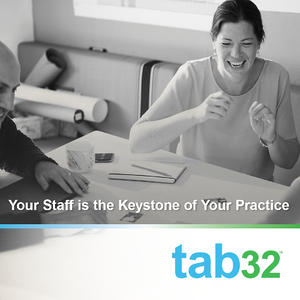 At tab32, we want to be part of your practice success. Front and back office staff love our intuitive, comprehensive practice management software. Want to learn more? Schedule a demo today!